As a youngster I read and sobbed over Harriet Beecher Stowe’s Uncle Tom’s Cabin, not widely read nowadays I appreciate, but it was a ground-breaking novel in its time. It was published in 1852 and acquainted Americans and the wider world with the evils of slavery in the USA and pressed for its abolition. It was not until I got to university that I discovered that some slaves and freed slaves had written their own stories, many of which were far more harrowing than anything Harriet Beecher Stowe had told me. The first book I read which was written by a former slave was the autobiography of Olaudah Equiano, published in 1789. He was an amazing man who had risen from slavery to become the first black person to explore the Arctic as a member of the Mulgrave expedition in 1773 and the first black employee of the British Government in 1786 organising resources for new emigrants to Sierra Leone. He toured England promoting his book to great acclaim and I can understand why, an enthralling, well-written book with a passionate implicit and explicit plea to abolish slavery. 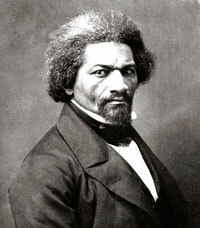 I then read the autobiography of Frederick Douglas, which was published in 1845. This book gave a detailed and emotive account of the life of this young man who at the time of writing had escaped slavery for the second time and, I expect, was living in constant fear of recapture. He subsequently became one of the leaders of the movement to abolish slavery in the USA, writing and giving speeches to promote the cause. If you have the chance to read any of the work of this brilliant man, please do. I am appalled to think of those slave owners of the time who said that slaves were not intellectually able to cope with being American citizens; my word, Frederick Douglas shows what rubbish that was!